Your ceremony will be one of the most significant and special events in your life. I will give you the right support, guidance and discretion to ensure a smooth and relaxed time in planning for your ceremony. Leading up to your day I will keep you up to date and informed about any relevant legal requirements and information. I will work with you to create a unique ceremony that captures your relationship. I can help with ideas and give you guidance. You may wish to have your favourite poem read by a special friend, a cultural ritual, a religious gesture or a simple story of your love. Your ceremony is about you and so long as you fulfil the legal requirements, you can style your wedding however you like, be it modern or traditional. On the day of your ceremony, I will arrive at the venue with plenty of time to set up and ensure that everyone is ready for the commencement of your ceremony. I will also support the groom during the eager wait for the bride to arrive. 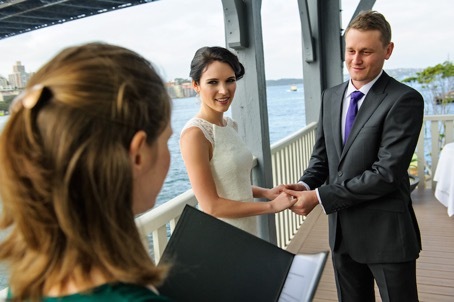 the registration of your marriage at the SA Births, Deaths and Marriages. Lets get creative together: $550 - I will help you to prepare a ceremony and give some tips and examples for you to think about. 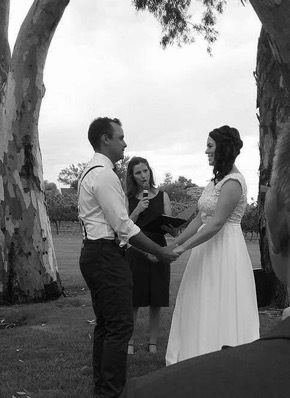 A fully personalised ceremony: $700 - I will prepare a fully personalised ceremony that captures your story and is written just for you. I am based in the Barossa Valley but also service the Gawler and surrounds, the Adelaide Hills, the Murraylands and Adelaide etc.